School classes are back in session and fall has brought a coolness in the air. Your kids are back to doing what they do best, learning, playing outside at recess and spreading germs. You can do what you can to help stop the spreading of germs, but unless you keep your kids in a plastic bubble, that is an impossible task. As such, this means that your children will be exposed to a number of conditions. Whether they get germs from sharing a pencil or coughing and sneezing that happens all around them, school is a petri dish for bacteria and disease. 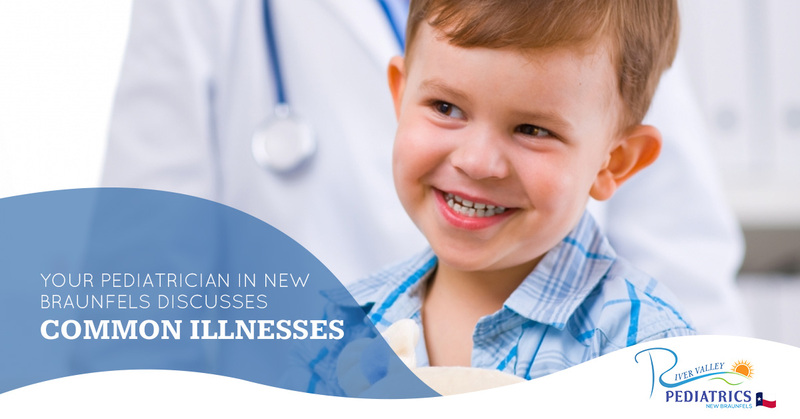 Your pediatrician at River Valley Pediatrics in New Braunfels offers a few common illnesses your children might come down with. Strep throat is an infection in the throat that is caused by the Streptococcus bacteria. Your child might catch it by sharing a cup or utensil or through coughing or sneezing. Strep is quite common among children aged five through 15. The big giveaway is an extremely painful throat which is accompanied by a fever that can get quite high. When you bring your child to our office, antibiotics will likely be prescribed. The flu is an upper respiratory infection caused by a virus. It is caught by being near people who are coughing or sneezing or by touching surfaces that have been touched by a carrier. The symptoms include a fever, chills, sore throat, body aches, vomiting and fatigue. The flu is a viral illness and should be treated with bed rest and fluids until it has run its course. A flu shot will help protect your children from this infection. Pink eye, known by its formal name, conjunctivitis, is an infection of the eye that is caused by bacteria, a virus or allergies. If your child has been exposed to the bacteria or virus and rubs their eyes, they could get pink eye. The symptoms of pink eye include a bloodshot eye, discharge, crust that forms along the eyelid and itching. A warm compress will help relieve the itchiness and pink eye caused by bacteria will need antibiotic eye drops. Although this old elementary school nemesis has been subdued by a vaccine, it can still pop up on occasion. Since this is a virus that travels through the air, it is extremely difficult to avoid it. Unless, of course, you are vaccinated. If your child has caught something at school, schedule an appointment with River Valley Pediatrics right away.